A little idle browsing: Facebook has a page for every app authorised to connect to its system, and those pages give active users (examples: iPhone, Blackberry). 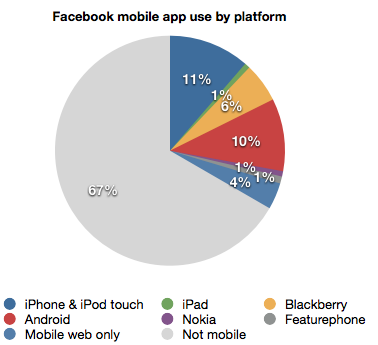 So, you can see how many people are using each Facebook app on each mobile platform. You can then compare that to Facebook’s figure for its total user base (750m) and for the number of people using Facebook with mobile devices (250m). The interesting complication is that there are lots of independent apps, especially on the iPad (where there is no official one yet) and on Android, where the OEMs make their own (and there may be overlap with people using both the OEM app and the official app). HTC, Samsung, Moto, SE and LG Facebook apps combined add up to 24m actives versus 53m for the official Android Facebook app. (update) All of the apps combined add up to 222m, not far off Facebook’s ‘250m mobile users’. 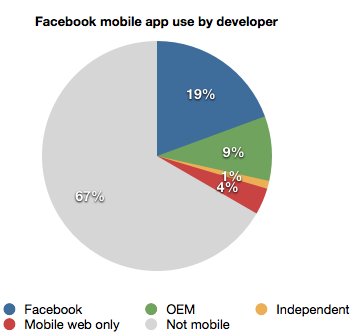 The implication is that the remaining 28m are the only people exclusively using the mobile web for Facebook (the ‘mobile web only’ category below). In reality the scope for duplication in these numbers (how many people have Moto Blur updating their address book but also use the official app?) means the real mobile web number is probably bigger - plus that conveniently round 250m number dates from April. But if we take only the official apps (and hence remove any possible duplication), we still get to about 200m app users versus 50m mobile web users. Meanwhile the Facebook app for the RIM Playbook has 93k active users. So RIM must have sold at least that many of the 500k it claims to have ‘shipped’.